Every Wednesday, strange things happen in Max’s village. 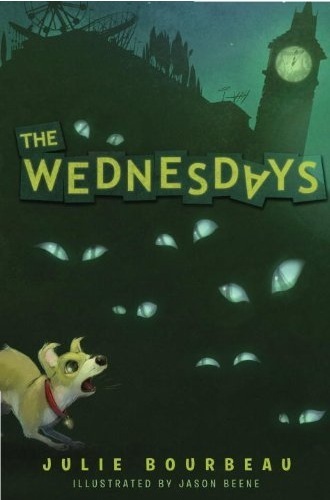 The townsfolk shutter their windows, lock their doors and hunker down to outwait this plague of peculiarities referred to simply as “the Wednesdays.” But Max is too curious for that, and when he accidentally lets the Wednesdays inside, his furious parents cast him out for the rest of the day. Soon he meets the Wednesdays themselves; strange silver-eyed boy-creatures bent on spreading mischief and mayhem. Initially he thinks they’re quite fun, but they can also be cruel and dangerous. With the assistance of an unlikely cast of characters including a popular girl with questionable motives, a slightly crazed parapsychologist, and the world’s ugliest dog, Max must put an end to the curse of the Wednesdays . . . or become one himself. Max. A case of the Wednesdays. Clock towers. Little bastards. Thursday. Blue dye. Baby Elvis. Bird poo. Parapsychologists. Piano Tuners. Drink fountains. Gemma Swift. Noah. Tree houses. The setting. I wanted more of everything because I’m greedy. More Max. More Noah. More Thursday. More story. But most of all more Wednesdays! In my head I had some kind of crazy hybrid of Gremlins, Yoda and Minions. YES. Also, I just checked the prices for flights from Manchester to Mt. Tibidabo and it’s so expensive. Even Ryan Air aren’t willing to cut me a deal. Oh Maxwell Valentino Bernard, which is possibly the best name ever. But it’s funny because if someone in a YA book was named Maxwell Valentino I would be so angry. But middle grade books can get away with it… because they are brilliant. Oh poor Max. He makes me look lucky and I’m the girl who once broke her toe when a packet of frozen mince fell out of the freezer onto it (I wish I was kidding). What I love most about mg books is that sense of adventure that our heroes have. When everyone in his town is cowering in their house on Wednesday, Max is all like “Whatever” and runs around, laughing, making friends and turning blue. Yes, that’s right. HE TURNS BLUE. Max is hilarious, and never whinges. Did I mention he turns blue? And has to wash his hair with oil? You see that’s the difference between Max and I… I would be sulking like no one’s business if that happened but for Max, it’s all part of the adventure! And I want to be best friends with him. I’ll just have to work hard on not making him cross. Because I know what he’s capable of and I want my clothes to stay dry. Well, I wish this was a regular topic on this blog. There are three things I feel MG/YA books need more of: Mummies, dinosaurs and parapsychologists. Anyway, Dr Conkle-Smoak (Telepathy, hypnotism, apparitions, and haunts… also piano tuning, but that’s just a hobby) is brought in to help out when Max gets a case of the Wednesdays. “Get to the point!” Max roared irritably. I think you’ll be OK with this one. But it does get a bit hairy towards the end. People who don’t like Mondays Wednesdays. People who will always be polite to people, whether they are monsters or not. People who like to get up to mischief. People who wonder why babies stare at them in an odd manner. People who have ever wondered how powerful their mind actually is. People who always wonder why the Town Hall clock is ever so slightly slow.